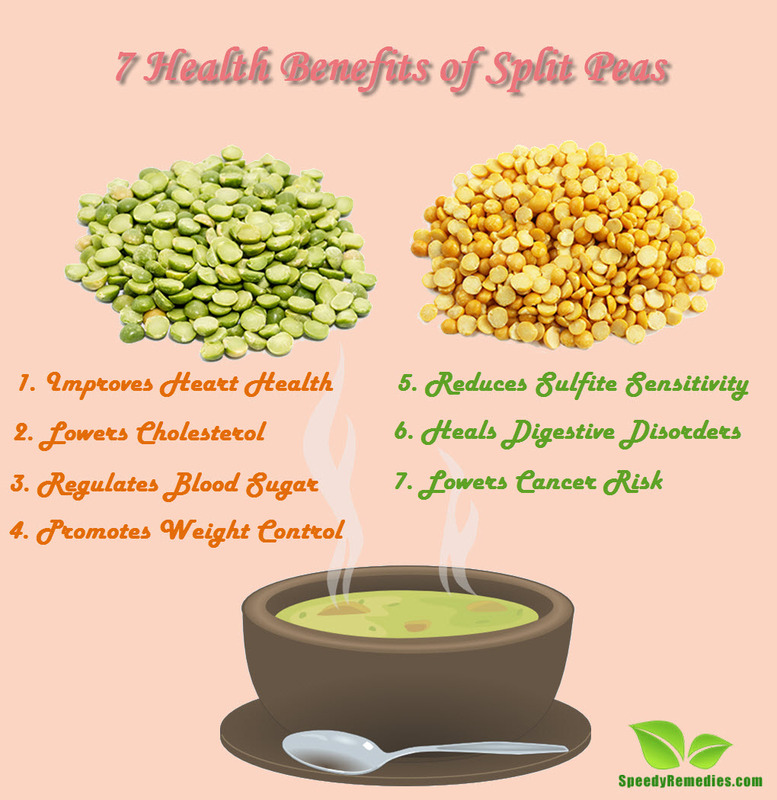 Split peas, whether green or yellow, are highly beneficial for your health. These dried, peeled and split seeds of Pisum sativum are high in fiber, protein, and various vitamins and minerals but low in fats. They are commonly used to make split pea soup. You can get whole as well as split dried peas from a supermarket or a health food store. 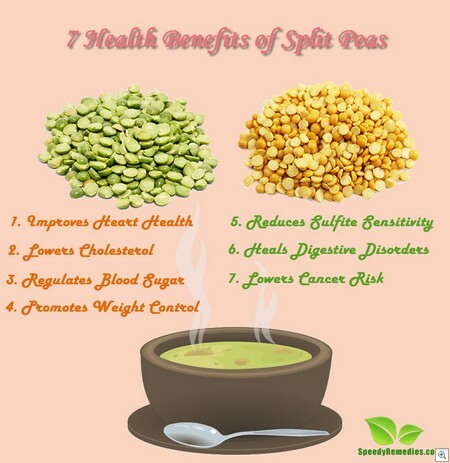 Split peas, however, should not be confused with split yellow gram (chickpeas) and split pigeon peas (Indian toor dal), though they belong to the family of beans and legumes. This low energy dense food is a variety of field peas that naturally split in half when they are dried. Given below are seven ways in which split peas are good for your health. Split peas are a good source of soluble fiber. In fact, taking a small cup of split peas in your daily diet can provide approximately 65% of the daily recommended value of fiber in your diet. Fiber is useful in reducing your blood cholesterol levels (total as well as Very Low Density Lipoprotein cholesterol). The fiber from split peas forms a gel-like substance in the digestive tract. So, it binds the cholesterol-containing bile and carries it out of the body. Split peas contain isoflavones (particularly Daidzein) that decrease the risk of developing certain types of cancers cancers, especially breast cancer and prostate cancer. Basically, isoflavones are a type of plant estrogens, so they mimic the hormones in the body. Studies have shown that Daidzein-rich isoflavones are also good for reducing hot flashes in menopausal women. Peas and split peas also contain high amounts of coumestrol. A Swedish study has shown that this compound may be asssociated with a lower risk of receptor negative tumors. The soluble fiber present in this low glycemic food slows down the absorption of sugars and hence helps release glucose slowly and steadily, thereby preventing a spike in blood sugar. Yet, it provides a sufficient and steady supply of energy. Therefore, it is good for people suffering from diabetes. Sulfite sensitivity can be experienced as symptoms like rapid heartbeat, headache, diarrhea, nausea and the same, due to intake foods containing sulfites. Usually, sulfites are added as preservatives in processed foods such as baked goods, jams, potato chips, syrups, starches, vinegar, etc. Individuals suffering from asthma are more prone to sulfite sensitivity. Split peas are packed with trace mineral called molybdenum which helps in the detoxification of sulfites. A cup of cooled split peas can provide almost twice the daily recommended value of this mineral in your diet. Split peas are good for your heart as they help reduce plaque in your blood vessels and hence prevent cardiovascular disease. Needless to say, the soluble fiber in this food lowers your blood cholesterol levels, thereby reducing the risk of developing heart disease, too. Split peas also contain potassium which helps lower the blood pressure. High blood pressure or hypertension, too, contributes to causing heart disease. Furthermore, it contains an amino acid called tryptophan that helps your body produce serotonin which in turn regulates sleep and improves your mood. Plus, it is nutritious (rich in vitamins B1, B5, K, and folate, iron, magnesium, zinc, etc.) and fat-free. It is particularly a good source of protein for vegans and vegetarians. It is also low in calories yet provides energy due to its complex carbohydrates. You can simply add cooked split peas in salads, soups, stews, even burgers to enjoy their health benefits. Individuals suffering from IBS are often advised to have a diet with more soluble rather than insoluble fiber as it works as a bulking agent and at the same time, allows for easily passable stools.